And here we are. 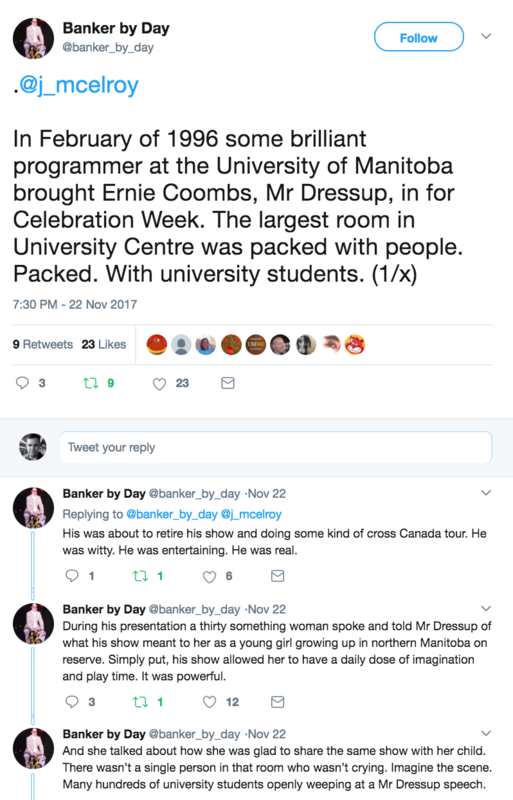 Mr. Dressup vs. Kids In The Hall. After hundreds of thousands of votes, and two weeks of tearing Canadian Social Media apart (insert stereotypical “Meanwhile in Canada” joke here), we’re left, after 64 initial entries, with two finalists. But first, let’s quickly decide which of the semifinal losers deserve third place. Alright, now that we have that out of the way, let’s get back to our melodramatic preview of the final. We have two incredibly worthy contenders for the title of most memorable (English) TV thing in Canadian history. Kids In The Hall and Mr. Dressup were discussed as heavy favourites from the outset of this tournament, and there’s no telling which one will win. But perhaps just as interestingly, they come from two very different places in our country’s collective psyche. Mr. Dressup is all about the broad strokes: your childhood, a feeling a comfort, a bonding of generations, 30 years of repetition, 30 years of crafts and sketches and costumes that are geared towards young children, but fundamentally accessible to all ages. Kids In The Hall is, um, not Mr. Dressup. It’s focused, passionate, character-driven sketch comedy, a cult hit that went big if there ever was one, a show of weird and daring conceits, a show for when you were 15 to 24, and somewhat difficult to understand if you didn’t love it during those years. it's going to be Mr. Dressup vs Kids in the Hall. A battle between your nostalgia for when you were innocent and your nostalgia for when you learned that you weren't. But this is the Internet. You have to pick one. In the balance hangs a victory that will be cited on various CBC programming for a couple of days, and for eternity 80% of the way through the Wikipedia entry for the winner. BIG STAKES PEOPLE. Here is the endorsement for Kids In The Hall. It comes from John Semley, who literally wrote the book on the group. Look, what am I? Made of friggin’ stone? I love Mr. Dressup. 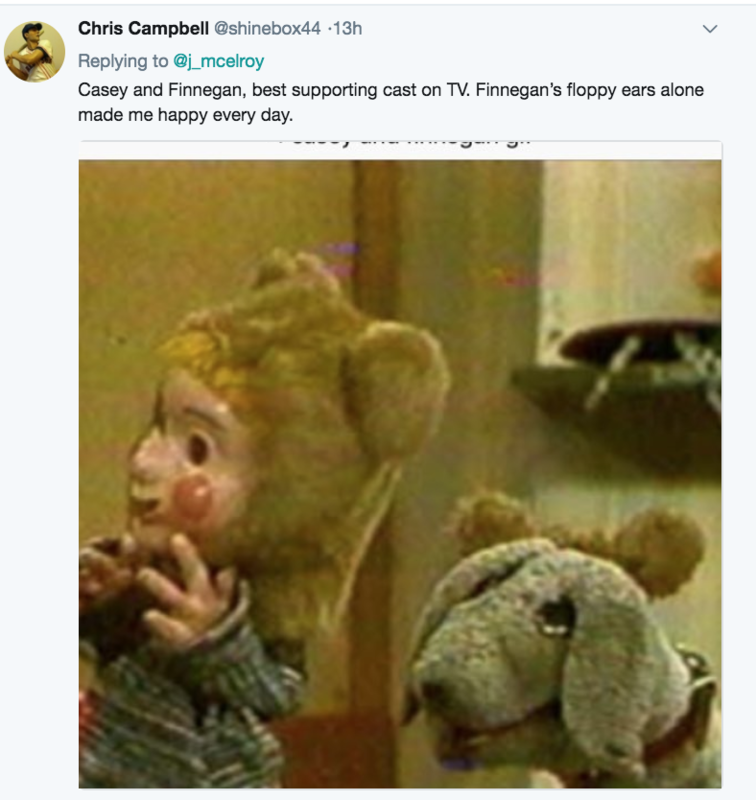 I grew up watching Ernie Coombs, Casey, Finnegan, Chester the Crow, that creepy-as-hell granny doll, and the whole gang, just like most Canadians born in this country between the mid-‘60s and the mid-‘90s. But that’s the thing, isn’t it? I grew up. Of all the other youthful entertainments I binged on, nothing escapes the honeytrap of nostalgia like The Kids in the Hall. (Peak Simpsons comes close, maybe.) With its biting satire (of business, of family, of whatever-you-got), weathered cynicism (“Screeeeewwww the bank I work for. screw the b-b-b-baaaaank”), exultant queerness, and ludicrous characters (a Belgian twit with a brain tumour whose imagination consists solely of an oompah band) and scenarios (a child molester winning a preserves contest at a small-town fair), the comedy of The Kids in the Hall feels meaningfully timeless. Sure, the fashions and haircuts may seem desperately dorky in a date, ‘90s grunge way. But the humour holds up — still funny, fierce, and, for the most part, wonderfully un-topical. Unlike a lot of other cheesier Canadian TV, The Kids in the Hall offers more than a warm-fuzzy reminder of the innocence of our bygone youth. If anything, it was the show that ruptured that innocence, and dragged generations of plucky adolescents into the bleak, jaded, hopeless landscape of teenage rebellion and, finally, adulthood. It remains a singular piece of Canadian entertainment, and of comedy, writ large. And even if your sole criteria for who wins this thing is the capacity to dress-up, well, the Kids’ own expansive wardrobe of wigs, dresses, poorly-tailored business suits, and flying pig costumes outshines even Ernie Coombs’ formidable Tickle Trunk. John Semley is a Toronto-based writer and author of This Is A Book About the Kids in the Hall (ECW Press). Here is the endorsement for Mr. Dressup. It comes from your childhood memories. I guarantee Mr. Dressup helped millions upon millions of Canadian children make what can be a scary thing — starting school — a much happier experience. Mr. Dressup WAS Kindergarten. The songs, the paper crafts, the stories and the tickle trunk mirrored my own K year with Ms. Caldwell at Mundy Rd. Elementary in Coquitlam, B.C. (except Ms. Caldwell had a dress up corner instead of a trunk). Can there be anything more noble? No, there cannot. And it’s time to say goodbye to this tournament. Voting is open until midnight PST on Sunday. Results will be announced on Monday morning. We’ll know when the winner is announced and it’s The Hedgehog in the Fog. I’m with DW, I’m feeling uneasy that the bar graph has disappeared. Who’s behind this? Should we follow the money? Or did Mr Dress-up send a couple of his thugs over to rough you up? Either way…. i feel dirty, and that i surrendered a piece of my soul having to choose one over the other. Damn you. Damn you all to hell. Personally, I would love to see a TIE between these two. Mr. Dressup was my favorite as a kid and Kids in the Hall ensured that inner kid did not die…. but rather raced down the hall trailing chicken feathers and flipping the bird. My god- the anguish and guilt having to make a choice… but… while I think with longing of those youthful 90s young adults we were, watching KITH we had taped off the tv onto VHS, watching on long winter Canadian nights, enjoying a Canadian and clam or four… nothing will ever replace the pure joy and excitement of hearing the “twit-twoo” on Mr. Dressup, and knowing the owl was making one of it’s rare appearances. I was a little girl obsessed, and my nickname was Finnegan. Thanks for this post, ahhh good memories. Heritage Minute: Ernie Coombs arrived in Canada in 1963 to work with Fred Rogers on a children’s show for the CBC. When Rogers went back to the USA, the CBC offered him a part in a new show, which became Mr. Dressup. And that’s why Canada needs the CBC. I’m sorry I didn’t get my act together earlier to vote but I have no problem with the eventual winner. I’m so glad I took the time to go back and read the whole thing though. So much entertaining and thoughtful writing by you, Mr McElroy. Plus Canadian culture. This is the sort of thing the internet is for.